Over the last two decades, the digital revolution instigated new typologies of architectural skins and patterns. 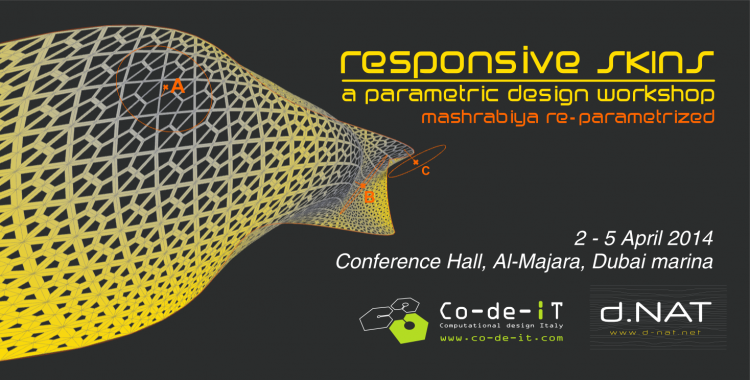 The Responsive Skins workshop will introduce the participants to the logic and principles of parametric design as a new design medium. After learning the new design tools and methodologies, we will explore the application of these techniques in a design exercise to re-define the traditional Middle Eastern device of Mashrabiya. After spending three days exploring the tools, techniques, and working on selected parametric exercises, we will apply the learned techniques to derive new typologies of a parametric Mashrabiya skins that are based on a given set of criteria for a building compound in Dubai. Differentiated skin formations will be explored in response to selected attractors fields. The students are expected to investigate parametric techniques to generate forms, skins, and pattern design based on a feedback loop and negotiations between the relevant forces and the participant’s aesthetic sensibility. – Advanced exercise: Data-reactive component – data-reactive tessellation on NURBS surface. * students, researchers & PhD (proof of status required). The deadline for registration is 30/03/2014. The workshop has 20 places available and will be activated with a minimum number of 14 participants.